Yesterday morning I was listening to Cleveland radio and as usual, the morning personalities were updating their listeners about the latest celebrity drama and gossip. I rarely listen to the radio but for whatever reason, I was tuned in and heard them reporting on yet another NFL player who has dogged Black women. Albert Haynesworth, a Washington Redskins player, was at the W hotel in DC back in February for a friend’s birthday party when he was accused of sexual assualt. There was a young Black woman who is a full time college student getting her hustle on as a cocktail waitress in the VIP section. Although there are conflicting reports, overall it appears that her hands were full yet Haynesworth was adamant about her taking his credit card right then. Apparently she nodded her head to signify that it would be okay for him to put the card in her shirt but he took it a step further by swiping his card between her breasts before fondling them. She told him to stop. 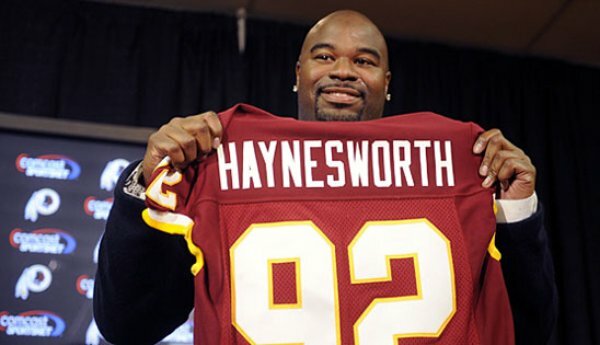 The prosecutor has offered Haynesworth a plea deal that he and his lawyers aren’t accepting. They have opted to take this case to trial. Smh. How about I despise little Black boys like Haynesworth? Ugh, he disgusts me. This story really isn’t getting any traction in the sports world mainly because of all the NFL lock out stuff and the NFL draft along with the NBA playoffs. Also, the media covered Haynesworth so much last summer I think they’re relatively tired of anything associated with him that isn’t earth shattering. i love how you’re ON it! i just posted this/haven’t had a chance to pub it yet…thanks! and i have no problem for him having preferences (you gotta respect that), but to flat out dog your own like that? that’s an epic fail IMO. Fat Al is only saying that because his fame and fortune couldn’t buy him no love from a hard working sophisticated sista. That’s probably why he don’t like black WOMEN (well the ones that can’t be bought). Haynesworth taking this thing to trial only costing him money. He should have settled. Baby girl about to have her tuition paid!! I agree with everything you said and yes he should have just settled. However, I think he should have settled just to put the story to rest and not cause yet another ongoing distraction for his teammates and not because he would probably lose. The more money you have the better lawyers you get and the better odds (almost a lock) you win a case that goes to trial (especially against a college-attending cocktail waitress). Now, that doesn’t make it right, but it’s the reality of the situation. Don’t believe me? Ask O.J., Michael Jackson (RIP), R. Kelly and Barry Bonds how all of their trials went? And R. Kelly was actually on tape! smh.